Alaska is filled with amazing hikes. Anchorage in particular has a vast network of trails ready for hikers of any ability. Follow this three day itinerary and you&apos;ll follow some of the most popular routes and get an amazing view of Alaska to start your visit. Forgot a piece of gear? Need snacks for your pack? You&apos;ll save more than space in your luggage if you get it here. Local outfitters carry what works best in Alaska, and Anchorage doesn&apos;t have a sales tax. Head for Glen Alps Trailhead and tackle Flattop first. 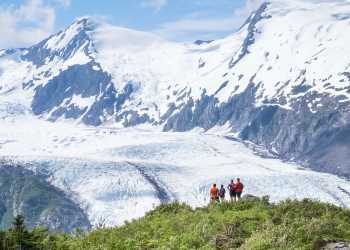 It&apos;s Alaska&apos;s most popular day hike, and you&apos;ll know why as soon as you reach the trailhead. Mountain vistas of the Chugach Mountains are to the west, and Denali looms on the northern horizon. Get your bearings; Anchorage stretches out before you like a map. Still adjusting? Follow Blueberry Loop for an easier hike. It&apos;s roughly 2 miles, and flat after a short slope up from the parking lot. Ready to claim some Alaska cred? Scramble all the way up the rocky slope the way locals do. The wide wood stairs and slopeside switchbacks add an additional mile (and 900 feet of elevation gain) to what you&apos;d hike on Blueberry alone. Rent a car or use Flattop Mountain Shuttle to get there. South Anchorage breweries are a popular stop on the way back from Flattop. Midnight Sun Brewing’s Loft is the perfect place for a little refreshment and a late afternoon meal post hike. Head upstream through the forest and spend a little time searching for gold at Crow Creek Mine. A short walk leads to a creekside clearing perfect for a first attempt at panning. At its peak, the mine produced 700 ounces of gold every month, and the glint of gold is still in the stream. With a little luck, a bit of skill and a lot of patience you might find a few flakes too. "Iditarod" may conjure images of dogsledding, but in this part of Alaska, it has a much older connection to hiking. The historic Iditarod Trail, used as a footpath by Alaska Native peoples and prospectors long before the advent of roads or rails, passes Crow Creek on a 1,500 mile route from Seward to Nome. The North Face trail zig zags up the side of Mount Alyeska, with views of nature in Chugach National Forest, glacier-carved ponds and the surrounding mountains all the way up. The 2.2 mile hike runs 2,000 feet up the side of the mountain. In the winter it&apos;s the steepest continuous double black diamond ski run on the continent. All that altitude means prime views of the area some still call "Glacier City." When you reach the top, you&apos;ve earned a feast. Refuel at Glacier Deli after your accomplishment. It&apos;s a filling meal paired with panoramic views of seven named glaciers hanging in the Chugach Mountains. Alyeska&apos;s aerial tram whisks hikers and restaurant patrons alike back to sea level. The ride down is free. Your feet move in more than one way. The Sitzmark has live local music and plenty of good times to fill an evening. Get some rest at Alyeska Resort or a nearby B&B. You&apos;ve earned a little rest and relaxation. Start the day with a warm cup followed by a relaxing spa treatment at the resort or back in Anchorage at the Ice Spa or Allure. Step out one more time. Take to the Coastal Trail for a quick walk. Westchester Lagoon is a good turnaround point a mile and a half down the trail. Or instead rent a bike for a faster way to explore further down the shoreline of Knik Arm. The lazy summer sun provides plenty of light on your final night. Many local companies offer customized day hikes in the areas covered here. Find a hiking guide.